Gillian’s passion for travel has brought her to all seven continents, and she uses those vast and varied travel experiences to ensure her discerning clients have an exceptional journey on each and every trip. 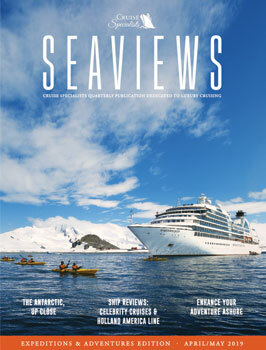 She is an expert in World Cruising, Alaska, Antarctica, Europe, the Caribbean and Eastern Canada. Gillian is particularly familiar with luxury cruise lines such as Crystal Cruises, Silversea, Seabourn and Scenic Luxury Cruises & Tours, along with Oceania Cruises and Holland America Line – where she was a sales director for more than 25 years. Additionally, Gillian works with boutique travel partners to orchestrate safaris and land packages. Thanks to her background in group, charter, and incentive travel at SeaDream Yacht Club, Gillian encourages family groups and businesses with as little as just 50 guests to consider chartering for their next adventure, making for an even more customized and enjoyable cruise experience, and she can effortlessly coordinate the entire process. Gillian arranged a marvelous trip to the Galapagos. Silversea was terrific. There were two or three hikes or snorkeling opportunities per day, with great guides and staff, and excellent food. Our Alaska cruise set up by Gillian was truly as good as it gets, with a lifetime of memories for the entire family. Our grandkids appreciated being included in more of an "adult" cruise, and we all appreciated rigorous activities, and more of the "Alaskan" experience.